Natural stones are hard and come in a raw form from stone quarries. Natural stones, such as marble, granite, sandstone, slate, and limestone, have to pass through some phases at stone processing units before it reaches to the doorsteps of end users. The natural stone tile or slab of your preference has to travel miles through seas and roads in securely-packed boxes, crates, and pallets. It is done so that stones can cope with all sorts of harsh treatments during the shipping from factories to ports to your country. 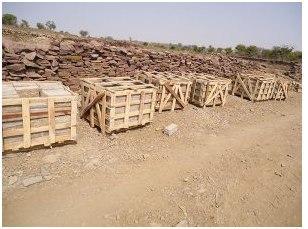 To ensure your stones don’t break away while in transit, packing stones in wooden crates is the basic need. Homeowners prefer tiles for natural stone flooring and slabs for stone wall cladding. But, a natural stone needs much care and attention until it reaches your home after facing lots of challenges. Standard packaging: Packers use polythene inside the wooden crate to guard stones against staining from wooden planks. On horizontal planks, a foam-sheet is used to protect slabs and tiles from damage by wooden planks or nails. It is the most popular packaging type. Pavers packaging: For packaging outdoor rough stones, packers use wood, hardboard, and foam sheet. These materials are useful for tightening loose gaps and protecting stones from being collided with each other. Polished natural stone tile packaging: Packers prefer to use a 2mm-foam or a paper cloth to pack polished tiles in a wooden crate tightly. It is done in order to save the polished surface of stones from abrasion scratches. Thinner tiles packaging: Thinner tiles of 10mm or 15mm size can break easily. That is why cardboard boxes are the best material to protect them. After packaging, these boxes are piled in the crate. The benefit of using the cardboard is to render tiles a cushion. Styrofoam (thermocol) boxes are also good for packing granite tiles and polished marble. For packing any slab, iron A-Frame or a wooden crate is the best option. On the other hand, cardboard boxes and thermocol boxes are the best materials for making natural stone tiles safe and secure in a wooden crate. 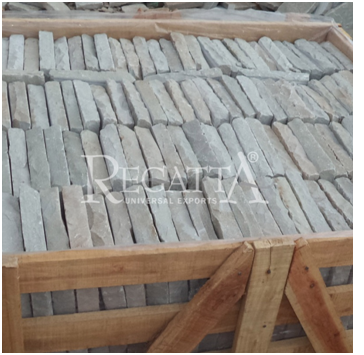 Regatta Universal Exports is a professional natural stone tiles and slabs supplier from India. 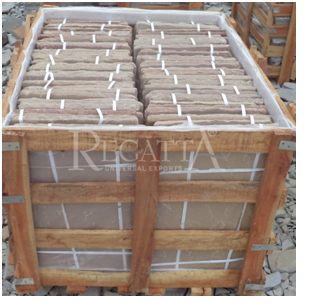 The company delivers its global customers a big range of stones for decoration and construction purposes properly packed inside strong wooden crates.